No.of Post : 22 nos. Applications are invited in Standard Form from Citizens of India for appointments to the post of Junior Assistants (L.D. Asstt.) 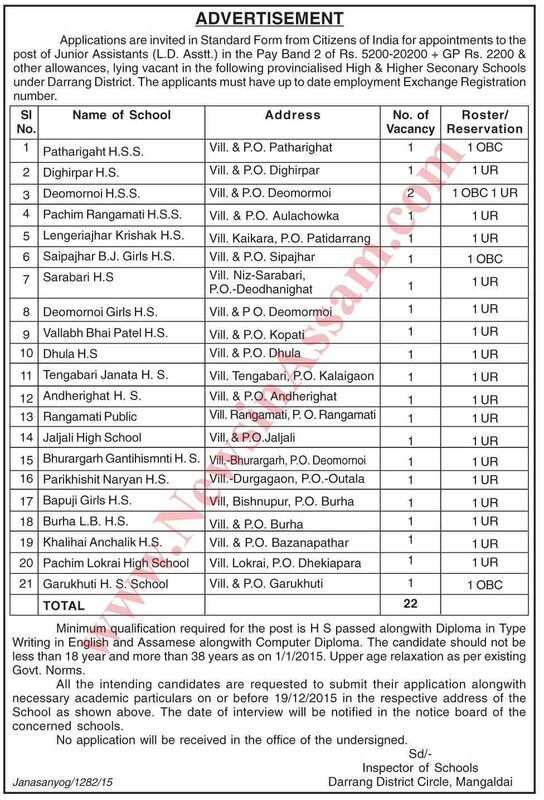 , lying vacant in the following provincialised High & Higher Seconary Schools under Darrang District. The applicants must have up to date employment Exchange Registration number. Scale of pay: Pay Band 2 of Rs. 5200-20200 + GP Rs. 2200 & other allowances. Age limit: The candidate should not be less than 18 year and more than 38 years as on 1/1/2015. Upper age relaxation as per existing Govt. Norms. Qualification: H S passed alongwith Diploma in Type Writing in English and Assamese alongwith Computer Diploma. All the intending candidates are requested to submit their application alongwith necessary academic particulars on or before 19/12/2015 in the respective address of the School as shown above. The date of interview will be notified in the notice board of the concerned schools.